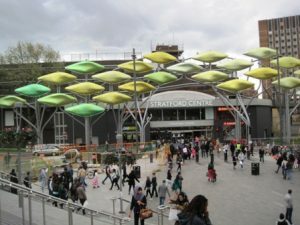 Westfield Stratford City is a new covered shopping centre next to the Olympic Park. It opened in 2011 and is anchored by John Lewisand Marks and Spencer department stores It has more than 300 shops including outlets of many high street chains. There are also 70 bars and restaurants, a cinema and a casino. It competes, if compete is the correct word, with the old Stratford Shopping Centre. The old Stratford Shopping Centre has been skilfully airbrushed out of the streetscape with a fig leaf or two in the form of an artwork called ‘The Shoal’. This was installed just in time for the 2012 Olympic Games. It positively shrieks at passers-by: “Don’t look at that horrible old shopping centre behind me – look at me I’m new and modern!”. I wonder who will pay for the maintenance of this structure in a location which is heavily polluted by the fumes of passing traffic on the busy A11 Great Eastern Road. It reminds me of the lyrics of a 1960s Frank Zappa song: “What will you do when the label comes off, and the plastic’s all melted and the chrome is too soft?”. Many local shopping parades in the area have recently been given an enforced surface makeover as part of the preparations for the Olympic Games. This has been at the expense of the taxpayer even though some of the shops are owned by well known multi-national companies such as Kentucky Fried Chicken. Several shopowners have complained about the poor quality of the work. Just what local people (and people in areas not so lucky in attracting such government largess) are meant to make of this extravegance on what is a superficial makeover in an area of high deprivation is unknown at this point in time. A few plucky stallholders still operate within the Stratford Shopping Centre selling such products as freshly baked bread and farmhouse cheeses.